Just as Buddhism is recognized as the teachings of Buddha, and Confucianism is a school of thought taught by Confucius, we now have an accurate and faithful word, Laoism, to describe the wisdom and teachings of Lao Zi. Lao Zi's philosophical undersanding of the Tao is collected in the Tao Te Ching. In contrast, his spiritual practices of the Tao are represented by the fourteen Chinese Characters which are called couplets. 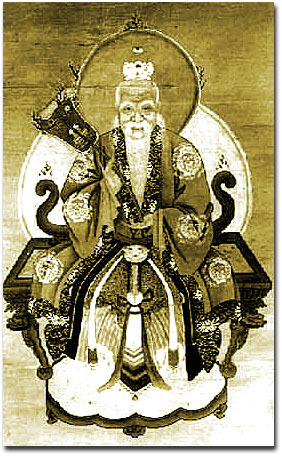 According to the teachings of the couplet, as it was passed on orally from generation to generation by those within the community of the Watch Tower Temple, all these characters were not only meaningful in each of their distinctive ways, but they were also viewed as a valuable collective summary of Taoism meditation practices. When comparing this couplet to all the world's spiritual teachings, these 14 characters offer one of the most concise and complete descriptions of meditation practices and spiritual cultivation ever conceived. The first half of the couplet teaches how to preserve the inner life forces according to the mechanism of the Tao, just as do the first 37 chapters of the Tao Te Ching. The second half emphasizes the practice of Te, as do the rest of the chapters of the Tao Te Ching. All in all, the couplet represents the extract of the Tao Te Ching by presenting the Laoist philosophy and its spiritual practices. Since the Tao Te Ching was first translated from French into English in the 1860's, there are over 200 translations circulating in the English market. One could enter a bookstore or local library and find several translations. Yet the tragedy is that in the minds of many people, including many Chinese scholars, the Tao Te Ching is no more than just another text on philosophy. It is not treated as a meditation guide or a spiritual work. Among all the translations, a few provide spiritual explanations. Most of the translations are merely literal interpretations of the Chinese characters. To bring one closer to the ultimate understanding of the Tao Te Ching, which is an awakening to the Tao, one must explore both the couplet and the Tao Te Ching as they are inseparable, indivisibly fused. The Tao Te Ching is a philosophical and spiritual understanding of the Tao, while the couplet is the sacred and mystical experience of entering into the Tao. For over 2500 years the words of the Tao Te Ching, the primary scripture of Laoism and Taoism, have been regarded as among the greatest treasures of the world. Lao Tzu, whose name means "the ancient child," wrote these essential verses that have both confounded and conferred blessings on humankind. Taoist masters Mantak Chia and Tao Huang guide readers through the origins of this philosophy, the meaning behind its 5,000 pictographs, and the way of living that generations have followed. While the text of the Tao Te Ching has been passed down in literary form for generations, the essence of the text can be understood only through heart awakening - a true integration of body and mind - made possible with the insights and exercises in this book. The authors analyze Lao Tzu's teachings, line by line, and offer meditations, interpretations, and energy cultivation practices that illuminate the true meaning of this classic text. Click here for selected excerpt.